This slick stuff is mostly educational (for the lazy, see the 30-second YouTube video courtesy of Alessandro). With all the accelerated graphics (with those alphabet soups) these days, who on earth uses ray casting for real-world apps? Nevertheless, since I still keep the piece of code (read: a function, literally) I wrote ages ago, why not giving it a try again? 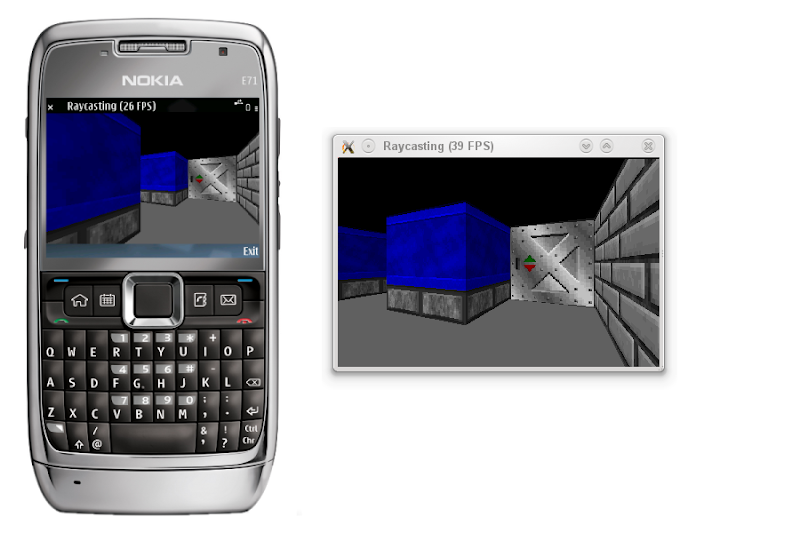 Testing it on Nokia E71 (powered by ARM 369 MHz processor), I am content to get a consistent 25 fps at QVGA resolution (and the code is still portable!). I reckon I need to resort to platform-specific, e.g. Anti Tearing API for S60, if I want to push the frame rate further. For the code and the explanation, head to the S60 ray casting demo. You would need the Qt 4.5 Tower release to build it for your favorite phone. Also, you need a four-way controller as I haven't bothered to let it run on a touch device.